The announcement was made on May 28th., 2012, before the plenary of the Conference, by Pastor Annemarie Werner, representative of the IRWF in Berlin. The packed audience included scholars, diplomats, researchers and government officials from various countries. Pastor Annemarie Werner, who flew especially to Moscow for the occasion, greeted the audience in Russian and highlighted the role played by the Soviet Union and the Allied Forces in the liberation of her own country, Germany, and the world at large, from the Nazi regime. At the same time, Pastor Werner urged the Russian authorities to give full and unfettered access to the KGB archives, in order to shed light, once and forever, on the fate and whereabouts of Raoul Wallenberg and his driver, Vilmos Langfelder, who were abducted by the Soviet forces on January 17th. 1945, never to be seen again. Quoting a letter sent back in 2006 by the then Deputy chief of the Russian Embassy in Washington to the authorities of the IRWF, Pastor Werner highlighted the fact that if Wallenberg was indeed executed by the Soviets, then the responsibility lies on the Soviet supreme leadership and on Joseph Stalin personally, and hence, it would be highly unlikely to believe that the assassination of such a high-profile individual such as Raoul Wallenberg, would have not left clear archival records. Pastor Werner also criticized the passive role played by Sweden along the years, failing to present a clear and strong demand to their Soviet counterparts, for the release of Wallenberg and Langfelder. Moreover, during the war, Sweden was neutral but provided Germany with strategic raw materials which were needed by the latter in her war efforts. Some of the Swedish businessmen involved in those dealings with Nazis, were cousins of Raoul Wallenberg. The IRWF has copies of their passports which show several entries to Berlin during the war. Quite unsurprisingly, this branch of the Wallenberg family did also nothing to help Raoul get free. Pastor Werner pointed out that Raoul’s mother and step-father, eventually committed suicide, out of despair for being unable to bring Raoul back home. His step-sister, Nina, is still alive. His late step-brother, Guy von-Dardel, spared no effort in his campaign for Raoul. His wife Matti and their daughter, Louise and Marie, continue this struggle. 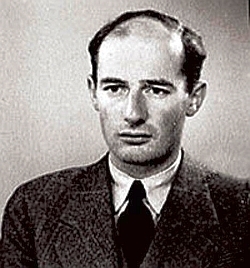 The main message the IRWF wants to get through is that instead of hosting an international conference dealing with Raoul Wallenberg, the Russian authorities should spare no efforts and come out with clear and credible answers as to the fate and whereabouts of Raoul Wallenberg and Vilmos Langfelder. Closing her keynote speech, Pastor Werner informed the audience that the IRWF has secured an earmarked donation of 100,000 euros, as an award to any person or institution providing solid information leading to the repatriation of Raoul Wallenberg and Vilmos Langfelder. “While the exact conditions will be made public and an official announcement, it should be clear that any information received should be corroborated by DNA and other accepted scientific tests. The “Raoul Wallenberg – the Humanitarian of the 20th Century” Conference was co-organized by The Institute of World History of the Russian Academy of Sciences, the Embassy of Sweden in Russia and the Hungarian Cultural Center in Moscow. Alexander CHUBARYAN, Academician, Director of the Institute of World History of Russian Academy of Sciences. Tomas BERTELMAN, Ambassador of Sweden to Russian Federation. István ÍJGYÁRTÓ, Ambassador of Hungary to Russian Federation. Dorit GOLENDER, Ambassador of Israel to Russian Federation, Representative from the Embassy of the USA in Moscow. Olle WÄSTBERG, National Coordinator for Raoul Wallenberg 2012. Hans MAGNUSSON, Inspector-General, Ministry for Foreign Affairs of Sweden. Alla GERBER, Chairman of the International Research and Educational Center “Holocaust”. Mikhail LIPKIN, Deputy Director of the Institute of World History of Russian Academy of Sciences. Tamás KRAUSZ, Professor, Eötvös Loránd University, Budapest, Hungary. “Holocaust: Old Evidences – New Myths”. Leonid TERUSHKIN, Head of the Archive of the International Research and Educational Center “Holocaust”, Russia. “The Search for Testimonies about Righteous among the Nations in Russia”. Szabolcsz SZITA, Holocaust Museum and Foundation, Budapest, Hungary. “Raoul Wallenberg Humanitarian Action in Budapest”. Kirill FEFERMAN, International Research and Educational Center “Holocaust”, Russia. “Hungarian Righteous among the Nations and Raoul Wallenberg”. Alexei KOMAROV, Leading Research Fellow, the Institute of World History of Russian Academy of Sciences. Vasiliy KHRISTOFOROV, Head of the Department of Registration and Archival Records of the Federal Security Service of Russian Federation. “Raoul Wallenberg: history of the archival search”. Ingrid CARLBERG, Author, Doctor Honoris Causa, Sweden. “Missed opportunities in the case of Raoul Wallenberg”. Bengt JANGFELDT, Center for History of Science, The Royal Academy of Sciences, Stockholm, Sweden. “Lwów: An Alternative Wallenberg Trail”. Johan MATZ, Researcher, lecturer at the Uppsala University, Sweden. “The Raoul Wallenberg case and the Diplomatic Communication of Sweden and the USSR 1944-1947”. Krister WAHLBÄCK, Ambassador (ret), Professor Emeritus of the Umeå University, Sweden. “Foreign Minister Undén’s handling of the Wallenberg case 1945-47 in the context of his views about the Soviet Union”. Samuil VOLFSON, Researcher, Institute of World History of Russian Academy of Sciences. “Perception of Raoul Wallenberg in the contemporary Russian society: phobias, stereotypes and myths.